The long-awaited historic rematch of Newport vs. Buffalo was a nail biter from start to finish on August 11th, 2018 as the weather miraculously held up for a high-scoring 11-11 tie after 6 regulation chukkers, followed by a suspenseful 3-round overtime shootout before Buffalo came out the victor. The city of Buffalo shares a similar story with Newport - humble beginnings and sudden emergence with the rising economic tide of the 1800s bringing the nation's new elite to the shores of these two eastern destinations for social & leisure pursuits. With that spirit, America's 1st polo club was established in Newport in the summer of 1876, and Buffalonians would follow within a year. The first inter-club match took place between the newly formed Newport and Buffalo teams in 1877. The Newport club's 125th jubilee included a rematch in 2002 between the two rivals, with Newport winning for the second time. The 140th anniversary of the historic contest gave Buffalo its first victory. Playing for Buffalo were Estelle England at #1, Justin Schick at #2, Estani Puch at #3 and Christophe Landon at #4. Newport fielded Laurel Howe/Clark Curtis alternating in the #1 position, Jenna Davis at #2, Hamish Wates at #3 and Dave Bullis at #4. Buffalo's strategy was to take an early lead, with the game's first 2 goals by captain Puch, before Newport's Bullis put a point on the new jumbotron scoreboard, and Puch ended the chukker with a hat trick, leading 3-1. Both teams earned a penalty goal in the 2nd chukker, for a 4-2 score. A high-scoring 3rd period was also a high fouling chukker, resulting in 3 goals on penalty shots for Newport, by Bullis, Wates and Davis, plus a field goal by Davis, and two penalty points for Buffalo by Puch and 2 field goals by Landon, giving Buffalo an 8-6 lead at the half. Bullis and Puch both scored field goals in the 4th chukker, while defense controlled the balance of the period. While his teammates clipped Buffalo's wings, Wates came out swinging in the 5th period adding 2 field goals to tie the score at 9 all, raising the stakes for an exciting final period. The 6th period's progress had the crowd cheering and gasping at every home team opportunity, as the lead changed back and forth, starting with a Newport goal by Bullis, answered by Puch, who then took the lead with a second goal, but a costly penalty 2 by the Buffalo side gave Newport the tying goal by Bullis, at 11 points each, sending the match into overtime. The two high scorers from each team came out for a penalty shootout, from the 40-yard line. Uncharacteristically, Bullis and Puch both missed their first shot, but then both drilled their next shot through the goal, Bullis from a cantor and Puch from a standstill. The next round, from 60 yards broke the tie when Bullis' shot went wide and Puch's earned the victory. During the match, a lucky winner of the weekly door prize drawing took home an official Team Rain Shell from the Newport Polo Pro Shop, and the Stella Artois Tailgate Prize went to a festive tailgate party with a tropical 'tiki' theme. Specialty vendors and concessionaires in the Vendor & Hospitality villages around the polo grounds served up the grilled fare, chilled fare, seafare, jewelry, sunglasses, cutlery, wine sampling, polo team gear and more. The match concluded with the Veuve Clicquot Champagne Toast & Trophy Presentation, as well as an autograph signing to meet the players. The 2002 Newport vs. Buffalo Trophy was presented by Jason Birkett, Director of Wine for RI Distributing Co., providing exciting wines to sample each week at this season's new Horse Shoe Wine Bar! Stay current with the 2018 team lineup, latest news, events and more by subscription to our eMagazine (sign up) and get match details from the Gameday Scorecard (sign up). Both subscriptions are private and spam free. The Newport International Polo Series is proud to present its 2017 sponsors including NBC - 10, BMW Centers of Rhode Island, ALEX AND ANI, Blue Cross & Blue Shield of Rhode Island, Gurney's Newport Resort & Marina, Hotel Viking, The Chanler at Cliff Walk, Vanderbilt International Properties, Veuve Clicquot Champagne, Brahmin, Stella Artois, Clarke Cooke House, Flint & Flame, Patrón Spirits, Rockstar Limo, Newport Daily News, Where Boston, RIB & RHEIN x New & Lingwood, Atria Senior Living and promotional partners including McGrath Clambakes, International Tennis Hall of Fame, America's Cup Charters, Bird’s Eye View Helicopter Tours, The Cocktail Guru, Newport Mansions, Island Surf and Sport and Scooter World. “Our sponsors have been with us since the beginning. Without their support, the Series would not be as extensive as it is,” explains Dan Keating, Polo Series founder. There's no sport like polo. Be a part of it! 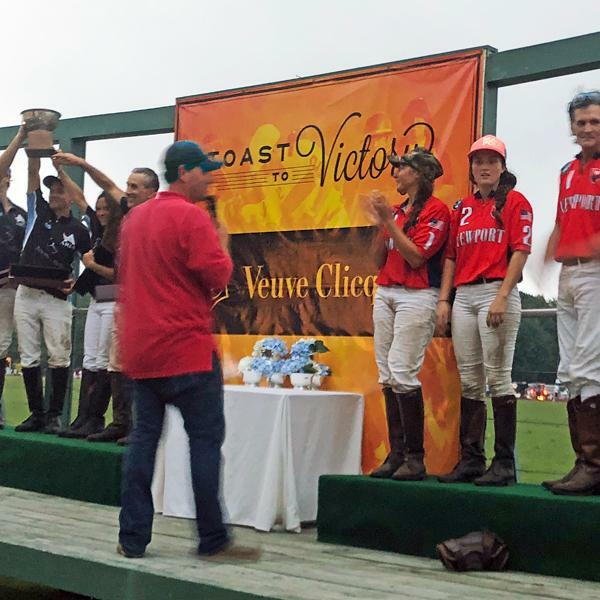 Newport Polo hosts the Newport International Polo Series XXVII, and is the home of America's first polo club, est. in 1876, and a founding member of the United States Polo Association offering public exhibition matches, polo club member services for grass & arena polo, and polo instruction year-round.